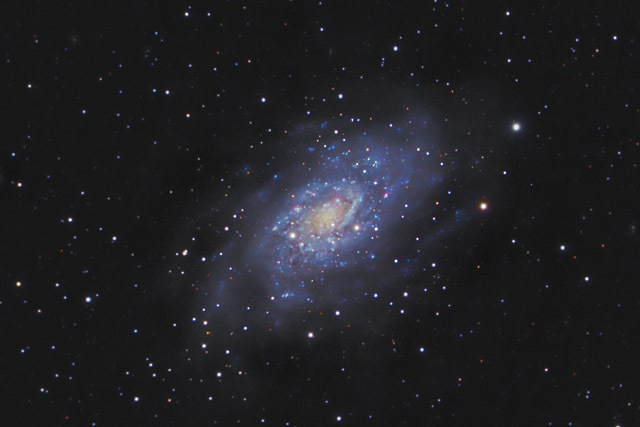 NGC 2403 is a moderate sized spiral galaxy in Camelopardalis and is believed to be part of the M81 galaxy group. The galaxy measures about 20' x 12'. In this image, North is Up. This image is cropped to 56% of the original full frame. Exposure 101 subexposures of 180 seconds each at ISO 1600 - about 5 hours total exposure. Software Used Images Plus 4.0 for camera control, calibration, stacking, and digital development. Images Plus 5.0 for advanced Lucy-Richardson deconvolution, multiresolution sharpening, star shrinking, smoothing and noise reduction. Photoshop CS5 used for levels and curves, selective color, high pass filter, saturation adjustments, color channel alignment, screen mask invert, lens correction, and smart sharpen. Gradient Xterminator for gradient removal. Carboni Tools for additional saturation adjustments, noise reduction, and smoothing. HLVG for additional color correction. Registar 1.0 for stack alignment. Notes I enjoyed imaging this object, as it is not a commonly photographed galaxy. While it isn't as impressive as larger galaxies, I like the detail this object has, and I was very pleased with the final result. This image was published by Astronomy Magazine as its Picture of the Day for March 25, 2016.